As many of you know, I love testing new beauty products. We have a beauty closet in the office that could compete with Allure’s (seriously). So when friends started asking me about rosewater, for example, "what exactly does rosewater even do", I felt like I had to share my favorites and how-to’s. Below are my five favorite rosewaters, how to use em’ and why I love em’. 1) While all rosewaters help soothe the skin, this Fresh Rose Floral Toner really doubles as a mask/makeup primer, setting spray as well as a natural hydrator (it’s Fresh, so you can expect natural extracts). It’s perfect for any skin type and really gives you that dewy glow. Overall it hydrates, tones and soothes the skin. 2) This selection was a no brainer because, well... coconut. I am a huge coconut lover so when I saw this had a coconut water base, I was sold. Plus the little glass bottle and beautifully simplistic label was too pretty to pass up. This particular face mist has hibiscus flower which speeds up cell turnover and maintains moisture. Make sure to use in between cleansing and applying moisturizer. 3) This certified organic toner leaves skin feeling hydrated while also tightening pores. 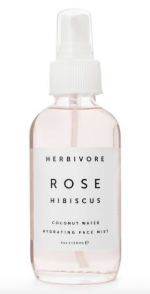 Used after cleansing, this rose petal toner clears away any soap residue and leftover makeup. It smells good and best of all, won’t break the bank. It’s only $10!!! Go! 4) Chantecaille wins for the purest rosewater, with its 99.9% botanical formula. The roses come from France and are used in a special formula to maintain a clear complexion and combat aging. It also brightens, hydrates, and contains vitamin C to help heal and nourish the skin. Truly love an all in-one! Plus it smells like a fresh bouquet of roses. 5) Jurlique’s Rosewater Balancing Mist can be spritzed on at any point in your beauty routine. This formula is meant to hydrate and soften while restoring your complexion and is best for normal to combination skin. This little bottle is perfect for the gym bag. Apply after a workout to feel refreshed and ready for the day. There are many added benefits to rosewater. Each provides a little extra something to make it specially a part of your beauty routine. Pick one and I promise you’ll never turn back.